Why does the Board think it is essential for the Resolutions at the General Meeting to be passed? Due to the unexpected communication from Mercuria Energy Trading SA (‘Mercuria’) on 18 January, a positive result for all six Resolutions are of vital importance to ensure the future development of the Company. Resolutions One and Two are required to progress the diamond activity. The Board considers this could be a company-making asset on a standalone basis, as demonstrated in a presentation to be released shortly. The Board is confident that Red Mercury, and therefore Vast, will obtain the right to mine in due course and believes that it is imperative to demonstrate the Company’s ability to implement a development plan promptly on receipt of the necessary approvals to Red Mercury. Resolutions Three and Four, as funding will be delayed due to the processes required to effect drawdown from alternative off-take prepayment, the previously announced short-term funding will be beneficial to meet loan commitments and maintain ordinary business without further disruption. Resolutions Five and Six, as per a presentation to be released shortly, Vast believes it has the potential to be cash generative relatively quickly and the accelerated investment programme at Baita Plai has the objective of the asset becoming self-sufficient after two months of production, and capable of supporting the Company’s overall capital requirements, reducing its reliance on dilutive funding in the future. When does Vast expect to conclude an off-take and pre-finance deal to replace the Mercuria deal? The Board is in discussions with five potential off-take partners, of which three are now in advanced stages of due diligence. The Board is hopeful of these negotiations being concluded quickly, potentially within three to six weeks, however these schedules, and the timings of any draw-down of funds, are largely out of the Company’s direct control and will be dictated by the relevant legal advisers and what the potential providers of finance require. It should be noted that the Board has been totally transparent regarding Vast’s position as a result of Mercuria’s decision not to proceed with the second tranche of funds which has resulted in the Company and the potential off-take partners working at an accelerated pace in order to close as quickly as practicable. What is the situation in Zimbabwe in terms of being confident of making further investment in this troubled country? Vast raised money at their request including £1 million recently and where has this gone? 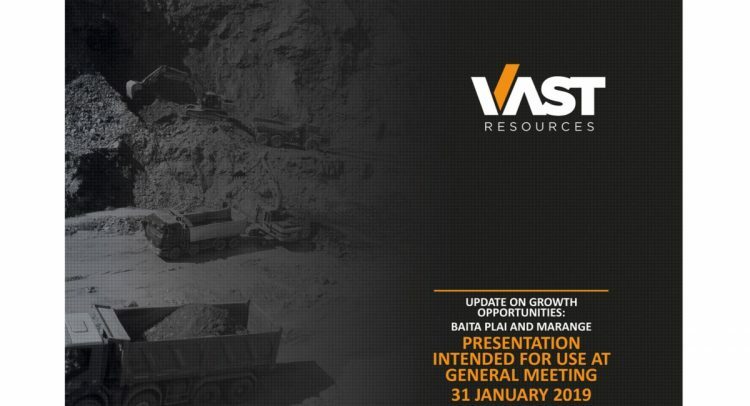 Should Vast not be focussing more on its Romanian operations, where the situation is much more stable? Are there still issues getting money out from Zimbabwe? There are concerns about investing capital prior to getting anything in writing from the Zimbabwean authorities about the diamonds. The Board holds the opinion that the recent unrest seen in some areas of Zimbabwe will subside and the President’s focus on attracting foreign investors is still at the forefront of his agenda. It is however critical that the funds are in place to commit to development once these investment criteria are satisfied. The RNS dated 25/1/18 states that the charge over the Romanian assets (re SSGI loan) would be released with the payment of $1.5 million by 31 December 2018. How much more is there to pay to release these assets? What is the total debt still owed to SSGI? Surely freeing up these assets allows debt funding to be completed? US$600,000 has already been paid of the US$1.5 million and a further US$900,000 is required to release the Romanian assets. Where are the project plans for Baita Plai and Eureka as broadcast in October 2018, and when will they be published? The project plan for Baita Plai is included in a presentation to be released shortly. The Board will not be in a position to release the Eureka plan until the Company’s 25.01% subsidiary has finalised the requisite funding. When will Baita Plai become operational? This is wholly dependent on having the funds to do so (which in turn involves having the ability to issue capital as requested in Resolutions Five and Six being passed) and having in place a replacement off-take agreement. The Company has commenced work on site, but the drawdown of the off-take will determine the start date of major works. The Company remains hopeful of commissioning by the end of H1 2019 but in any event commencement should be within 6 months of funding being secured. Can the headroom requested for each project in the Chairman’s letter be fixed to that project? The headroom for the diamonds is restricted to the development of the Heritage Diamond Concession and the headroom for Bergen is restricted to the Bergen funding. The £800,000 nominal headroom will be directed towards Baita Plai; however it is not specifically ring-fenced as such. A couple of Zimbabwean officials have stated in the press that Vast is one of the chosen companies to develop the diamonds, why has this not progressed? Has Red Mercury applied for the full mining licence as per the agreement with them? Is Vast still in communication with the Zimbabwe government in relation to being one of the four able to mine diamonds in the country? Red Mercury has applied for the Mining Licence in accordance with the usual and proper procedures however due to the recent unrest in some parts of the country, the focus of the government has been on stabilising these areas of disturbance rather than on the issuance of new licences. Notwithstanding this, the Board and management are in regular communication with the authorities and partners in Zimbabwe and the Company is still expecting a positive outcome hence the request for Resolutions One and Two. Vast itself has not applied for a licence. Can you give some idea of future profits from BPPM and the Red Mercury concession if they go to production? Please refer to a presentation to be released shortly which provides some indication of what we feel based on our internal analysis. How, specifically, has Vast used the £1,000,000 raised on 2 November 2018 to increase shareholder value? Please no reference to the Chairman’s Letter. These funds have largely been spent on repayment of capital to SSGI and have allowed the Company to proceed with the Heritage Diamond Concession, assemble the requisite diamond mining team, and prepare the desktop study for moving forward into development once the necessary approvals are received. Why so soon after the AGM, when the shareholders had co-operated in granting an increase in headroom, another one is being asked for virtually similar reasoning – is this not poor financial planning and living way beyond our means? At the time of the AGM the Board was confident that the second tranche from Mercuria was proceeding – this remained the case until 18 January when the Board was advised to the contrary. As a result of discussions with a Competent Person appointed by Mercuria it was decided, as announced in the Chairman’s letter of 15 January 2019, that increased development capital would be required by an accelerated move to full production. This and developments with the Heritage Diamond Claim modelling, has necessitated further investment with the objective of accelerating nearer term cash flow. Is Vast at crisis point and potentially going bust if we do not get some cash soon? Without the resolutions being passed and without the resultant additional capital injections to the Company, Vast will be prevented from expanding into profitable production, and could therefore be in a financially vulnerable position. Please give specific and accurate reasons as to why this Q&A session will be distinctly different in respect of actions, achievements and outcomes compared to all previous sessions which have delivered disappointment and delivered stress to the SP. Will the answers be ratified and/or endorsed by immediate RNS action, for example? The purpose of this Q&A is to assist shareholders in understanding what has already been announced via an RNS. The Company has a regulatory obligation to release all price sensitive information via RNS without delay and the Board will continue to do this in respect of all appropriate actions, achievement and outcomes. The Board is not in a position to provide any insight into the content or timings of future RNS announcements at this time as they are dictated by developments occurring operationally or corporately in real-time. Eureka, becoming even more crucial to support the company with profit and cash flow, is yet another speculative asset, which you have not, or cannot give an accurate production date or forecast. Any attempt to do so has been woolly or finger in the air guestimates. Again, this mine is becoming critical to Vast’s future, therefore, one could expect you to have your finger on the pulse and be able to give an accurate date. Why have you failed to do so in respect of significant beneficial interest to Vast? Eureka is an interesting, and potentially lucrative, aspect of Vast’s entire portfolio however in terms of the Company’s risk/reward matrix, it is of lower priority compared to Baita Plai and the Heritage Concession. The two aforementioned assets have the potential to deliver short pay-back periods compared to Eureka, and this is why Baita Plai and the Heritage Concession have been selected for accelerated development to deliver positive cash flow in as short timeframe as possible. Without further dilution what other options have you assessed to ensure we have enough cash available to Vast, for example selling Pickstone-Peerless, or closing Manaila? Divesting the Company’s remaining interest in Pickstone-Peerless may be an option as is putting Manaila on care and maintenance, however the Company would still require funding to bring the near-term cash producing assets in to production. Furthermore, there is also a liability of US$4 million to Mercuria for the Tranche A funding that would become due and payable should the Company cease operations at Manaila. Whilst producing, the Company maintains a level of optionality over Manaila as the new off-take partner may also take over Tranche A and fund the expansion of Manaila which is expected to transform its production profile and financial performance. When do you believe this company can, and will be in a position, to achieve its ambitions, plus regain credibility and strategic intent? The current performance, overall, is miserly and unsustainable. With the new off-take partner in place and with the headroom being requested under the various Resolutions, the Board believes that the Company will be in a position to realise its stated strategic objectives in 2019. Based on the current information on Baita Plai and the Heritage Concession, and if the Company is able to execute its production plans as envisaged, these assets will be self-sustaining and should also cover corporate overheads in order to generate profits for the group. When will the new trucks arrive at Manaila? The new trucks are due at the end of February; however, this introduces a significant cash flow burden to the Company in the form of lease repayments that Vast cannot service until the new off-take partner is in place. There has been a lot of speculation in the Zimbabwe press regarding the Russian and Chinese companies being the named as obtaining the licenses to mine diamonds in Zimbabwe and Vast has not been given a license to mine. Can the shareholders please have some clarity on these rumours? The news is technically correct, Vast has not been given a licence to mine diamonds with the ZCDC on current claims. As explained in the RNS dated 22 August 2018, under the Agreement with Red Mercury, Red Mercury willbe responsible for providing a full mining licence and Vast will be responsible for, as per the agreed principles of the Joint Venture, to procure funding such as is necessary to develop an efficiently operating diamond mine on the Heritage Concession.